Hundreds of members of Montreal’s Jewish community, politicians, and other mourners gathered at a synagogue on Oct. 29 to remember the 11 Jews murdered last weekend in Pittsburgh. The rabbi of the Beth Israel Beth Aaron synagogue, Reuben Joshua Poupko, watched as people streamed into the main prayer hall, filling every pew as well as the upstairs balcony. “There are members of all communities here. The Jewish community doesn’t stand alone and it doesn’t grieve alone. The pain is shared by many,” he said. 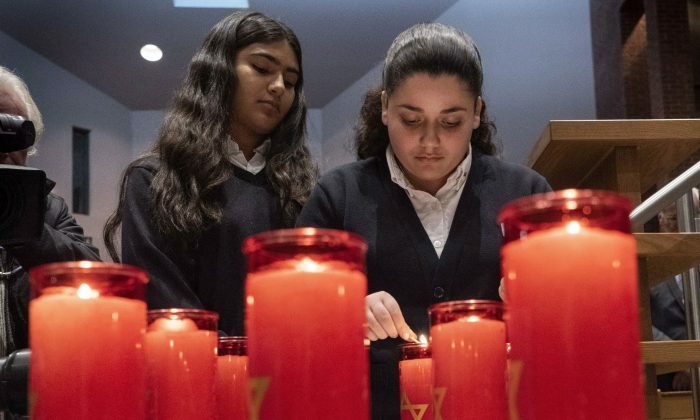 Multi-faith vigils commemorating the slaughter in the Pittsburgh synagogue also took place in Toronto and Edmonton. Federal Conservative Leader Andrew Scheer shrugged off suggestions Oct. 30 that Ontario Premier Doug Ford was overshadowing him on matters of importance to the national Conservative cause, saying they simply share common goals. Scheer faced pointed questions about Ford’s political influence after meeting with him at Ontario’s legislature, where the pair discussed issues including their opposition to the federal Liberal carbon pricing plan. When asked whose brand was stronger, Scheer said he and Ford were both working toward improving life for Canadians. Researchers say a month of abstaining from cannabis leads to improved memory in adolescents and young adults who are regular users of weed. A study by the Massachusetts General Hospital found that young people who stopped using cannabis for 30 days had a better ability to learn compared to peers who continued to smoke, vape, or ingest pot. The authors note that adolescence and young adulthood are critical times for brain development, specifically for brain regions that are most susceptible to the effects of cannabis. The study is published in the Journal of Clinical Psychiatry. Federal Transport Minister Marc Garneau says Ottawa is open to helping affected provinces pay for bus service in communities where private enterprise has not come forward to service abandoned routes. The announcement came as Greyhound ended service on all but one of its routes in the West as of Oct. 31. A vocal opponent of the Putin government says Canada is about to deliver her into the arms of Russia’s secret police. Russian scientist Elena Musikhina and her supporters are pleading with the Trudeau government to let her stay in Canada on compassionate grounds. Musikhina says her family fell into disfavour with Russian authorities for condemning Moscow’s military incursions in Ukraine and saying Russia illegally annexed Crimea, among other issues. She fled to Canada in 2015 and sought refugee protection but was refused. Her supporters say a half-dozen other researchers and officials who were aware of the data she uncovered died in mysterious and violent circumstances.